Organic makeup is much easier to make than you might think. Many of the recipes involve using ingredients that you can probably find in your very own kitchen. In recent years organic makeup has experienced quite a surge in popularity as more and more people search for products that are good for them and for the environment. Organic makeup does not contain any harsh chemicals or preservatives the way many other makeup products do. Thus, the use of organic makeup is much less damaging for your skin and body. Moreover, disposing of the makeup does not harm the Earth's delicate ecosystems. Ingredients: essential oils, beeswax, shea butter, cocoa butter, mica, vitamin E, cornstarch, chocolate extract, dark chocolate, castor oil, fragrance oils, avocado, mayonnaise, lemon, aloe vera gel, sweet almond oil, macadamia oil, virgin olive oil, and solid coconut oil. Purchase some essential ingredients, and find recipes for various organic makeup products. Depending on the recipe, you will need certain makeup-making supplies such as waxes, cream bases, earth-based minerals and other materials, fragrance oils and essential oils. You will also need some natural products like avocado, lemon, vanilla extract, olive oil and crushed herbs. You can purchase these ingredients at organic food stores as well as from makeup suppliers. There are many makeup recipes available online as well as in various recipe books. Check the resources section below for some recipe guides. 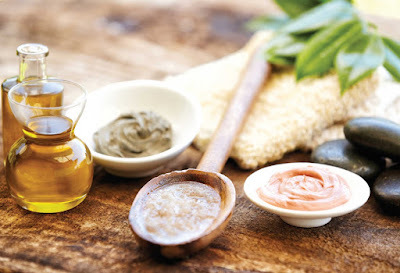 Make a moisturizing body cream using organic ingredients. You will need 3 oz. of unrefined cocoa butter, 1 1/2 oz. of coconut oil (the solid white kind, not the liquid kind), 1 oz. avocado oil, 1/2 oz. of macadamia oil, 1/2 oz. of virgin olive oil, 2 tsp. beeswax, 1 tsp. of vanilla fragrance oil for scent, 1 tsp. of vitamin E, and 1 tsp. of cornstarch. Gently heat all the ingredients (except the vanilla fragrance oil, vitamin E and cornstarch) until the beeswax and cocoa butter have completely melted. Allow the mixture to cool while stirring frequently. Place it in the freezer for about 3 minutes and then remove it and beat it with an electric beater. Repeat this process until the mixture is light and fluffy like whipped cream. Add the cornstarch, vitamin E and vanilla oil and beat the mixture for a few more minutes. Store your deliciously fragrant and moisturizing body butter in a glass jar for future use. Make an organic mineral blush that will give a nice glow to your cheeks. You will need two scoops of bordeaux mica, one scoop of oriental beige mica and half a scoop of splendid blue mica: Please note that the organic mica and other similar minerals must be purchased from a makeup wholesaler. Mix all the mica together in a small plastic bowl until the colors have completely blended together. Use a spoon to break up any solid pieces of the mica; you may also use a coffee grinder if the pieces are particularly large or hard. Store the blush in a plastic container for future use. Use a regular blush or powder brush to apply the mineral blush to your cheeks. Make a soothing and fragrant lip balm. You will need 3 tsp. of shea butter, 1 1/2 tsp. of sweet almond oil, 1 tsp. of castor oil, 1/2 tsp. of cocoa butter, 1 tsp. of chocolate extract, 1/4 tsp. of dark chocolate or 1/2 tsp. of cocoa powder, 1/4 tsp. of aloe vera gel and 1/4 tsp. of sweet orange essential oil. Melt the shea butter, only 1/2 tsp. each of almond oil, cocoa butter and castor oil and blend them until you get a cohesive mixture. In a separate bowl, melt the chocolate and the remaining 1/2 tsp. of almond oil. Add it to the previous mixture along with the chocolate oil. Use an electric beater to combine the two mixtures, and then place the mixture in the fridge so that it can cool and harden a little. Remove it after about 5 minutes and beat it again with the electric beater. This will give the mixture a nice, creamy consistency. Finally, add the aloe vera gel and orange essential oil and mix well. Store the final mixture in a small container or empty lip balm jar for future use. Make a face mask using just avocado, mayonnaise and lemon juice. Mash up a whole avocado and add about 6 tbsp. of mayonnaise; blend well. Add about 4 tsp. of lemon juice and mix until you have a creamy consistency. Apply the mask to a clean, damp face and leave it on for about 30 minutes. Store any remainders in the refrigerator for future use.